President of the Japanese Chamber of Commerce of Northern California Tadao Ogaki provides judges’ comments. Photo used with permission of the Consulate General of Japan in San Francisco. Japanese teacher Keiko Howard notes that she typically tells her classes about the contest by putting information on the whiteboard and sending it through Schoolloop. Howard encourages students to participate, as she feels that it’s a good opportunity for them to practice speaking in Japanese in front of an audience. After winning last year, Beeram decided to try again this year. Though she did have past experience, Beeram felt her preparation for this year’s contest was more rushed. The number of contestants was limited; each school can only enter one candidate and two alternate candidates. The alternate candidates are only accepted if extra spots are available, when other schools do not participate. Howard expresses that the time limit was also due to communication from the contest’s organizers. 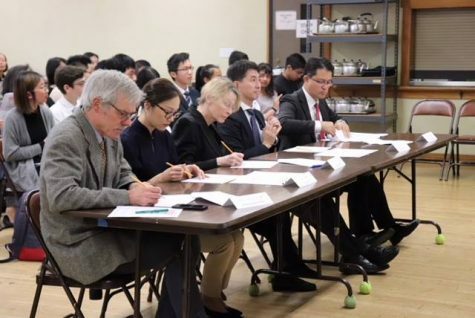 The audience and panel of judges, which includes Shoichi Nagayoshi, Yoichi Aizawa, Christy Bartlett, Aya Ino and Stephen Roddy, observe the speeches of contestants in the middle school and high school division. Photo used with permission of the Consulate General of Japan in San Francisco. Though the short amount of time to write her speech was a challenge, Beeram was already familiar with the competition and how to prepare for it, making the overall process smoother. She wrote her speech, then asked Howard to revise it. As Howard’s students have been participating in this contest for about 10 years, she is familiar with the judging process and also provided guidance in other aspects, such as with the time limit or when choosing a topic. 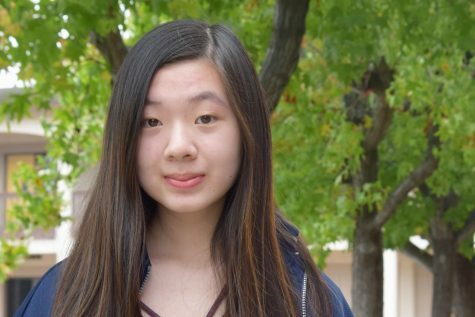 Beeram’s chosen speech topic also reflected her original reason for wanting to enter the contest — her fear of public speaking. 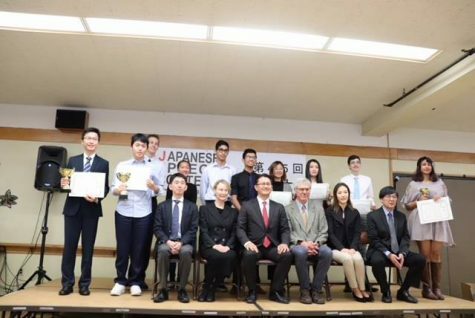 The judges and contestants of the Japanese not spoken at home category and under the middle school and high school division stand on stage. Photo used with permission of the Consulate General of Japan in San Francisco. 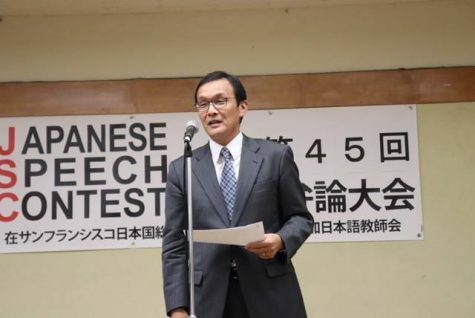 Though Beeram was “very scared” while giving her speech, she was ecstatic to find out that she won third place, competing in the Japanese not spoken at home category and under the middle school and high school division. Beeram accomplished her goal, which was to get top three and earn a spot at nationals, in which she could then potentially qualify for the worldwide competition in Japan. At the San Francisco contest, Beeram received a third place trophy along with a certificate of achievement and will be heading to nationals in Los Angeles. Header image used with permission of the Consulate General of Japan in San Francisco.